The National Renewable Energy Laboratory (NREL), the only U.S. federal laboratory dedicated to renewable energy and energy efficiency research, development and commercialization, installed its second fuel-efficient, hydraulic-hybrid system on a passenger shuttle bus for the lab’s 632-acre campus in Golden, Colo. The hydraulic hybrid system, made by Colorado-based Lightning Hybrids, is now running on two of NREL’s campus shuttle buses in Golden. 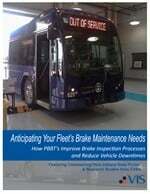 The hybrid system makes the buses cleaner, more fuel efficient and improves their braking efficiency. The first Lightning Hybrids bus has been in service on NREL’s campus for more than a year and the second bus went into service last month. 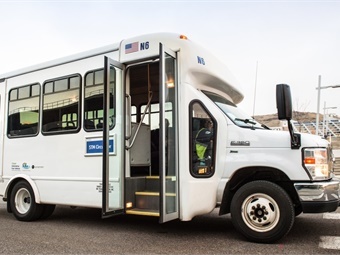 The buses, both Ford E-450s are run by MV Transportation, NREL’s service provider for their shuttle service. MV transports more than 500 NREL employees and visitors around the campus. The system from Lightning Hybrids is a patented, parallel hydraulic-hybrid system that has no electric batteries. Instead, it applies a hydraulic system to the driveline of a vehicle to regenerate braking energy. Hydraulic pumps and a lightweight accumulator brake the vehicle, store the braking energy, and then, use that stored energy to provide power to the wheels. In doing so fuel is saved and harmful emissions are cut. NREL works with public and private organizations to research and develop innovative vehicle and sustainable technologies to reduce dependence on fossil fuels to improve U.S. energy security as well as air quality.